"I have made these since 1989. They are always a hit when I make them for my son's class." In a large bowl combine butter and peanut butter; beat until creamy. Add brown and white sugar and beat until fluffy. Beat in egg, vanilla extract and baking soda until well blended. With mixer on low, mix in flour just until blended. Cover and chill for 1 hour, or until firm. Shape 1 level tablespoon of dough into 1 inch balls. Taper each ball at one end into a teardrop shape. Press flat on one side. Place flat sides down, 2 inches apart on ungreased cookie sheets. Press the sides of the dough in to raise the 'backs' of the mice, as dough will spread slightly during baking. 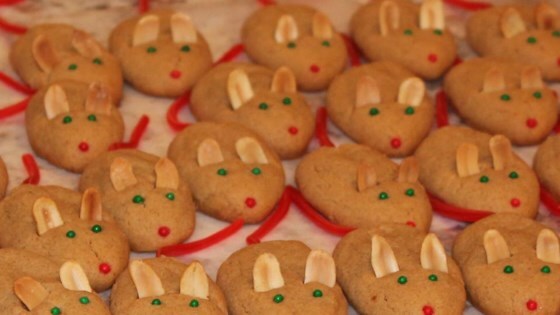 Gently push 2 peanut halves in each 'mouse' for ears, and 2 pieces of green candy for eyes. With a toothpick make a hole 1/2 inch deep in the tail ends. Bake in preheated oven for 8 to 10 minutes, or until firm. Transfer to a cooling rack and insert licorice pieces as tails. These are cute but VERY time consuming and difficult to work with. The tails are challenging and the dough does not hold together very well for molding. They do taste quite good though. SOOO Cute. Made these for my Christmas cookie boxes and everyone is still talking about them. I also decorated them with mini candy holly leaves, just at the base of one "peanut half ear".